The heavy duty storage boxes are an ideal multipurpose storage solution for around the home and garden or work place environment. 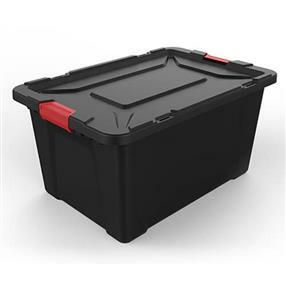 The robust materials and design ensures the containers contents are protected when stored or while in transport. It also features a stackable design neatly storing boxes on top of one another safely while utilising space. The lid also features holes giving you the ability to further safeguard your contents by padlocking the lid closed.